The #Trump White House breaks a new record - The most staff fired, or quit, of any President. Ever. In history. More than one in three Trump staffers have left the White House in just its first year, a pace that far eclipses the rate of departures in the previous five White Houses, according to a study done by Kathryn Dunn Tenpas of the Brookings Institute. 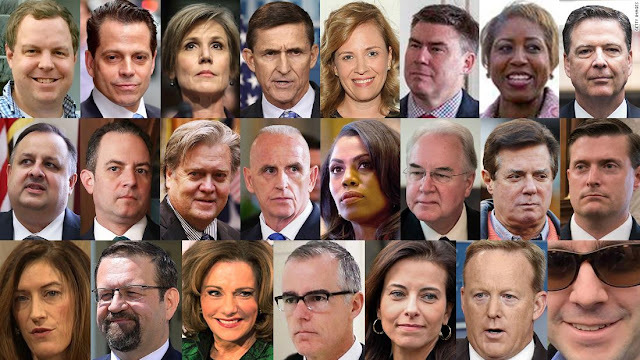 "Six of the 12 Tier One positions saw turnover (Reince Priebus, chief of staff; Katie Walsh, deputy chief of staff; Sean Spicer, press secretary; George Sifakis, assistant to the president and director of the Office of Public Liaison; Michael Flynn, national security adviser, and KT McFarland, deputy national security adviser). By comparison, Obama lost one adviser from Tier One (Greg Craig, White House counsel), and George W. Bush did not see any turnover in these high-level positions." And her paper came out in mid-January -- meaning that Dunn Tenpas missed a number of more recent departures, including former staff secretary Rob Porter; Rachel Brand, the third-ranking official in the Justice Department; and speechwriter David Sorensen, all of whom left in the last week. Just some of the staff who have stepped into - and out of - the White House.